Well folks, it’s getting to be the end of summer and it’s time to start thinking about your fall plans. For those of you on the East Coast who enjoy cycling, here’s an interesting event for you. 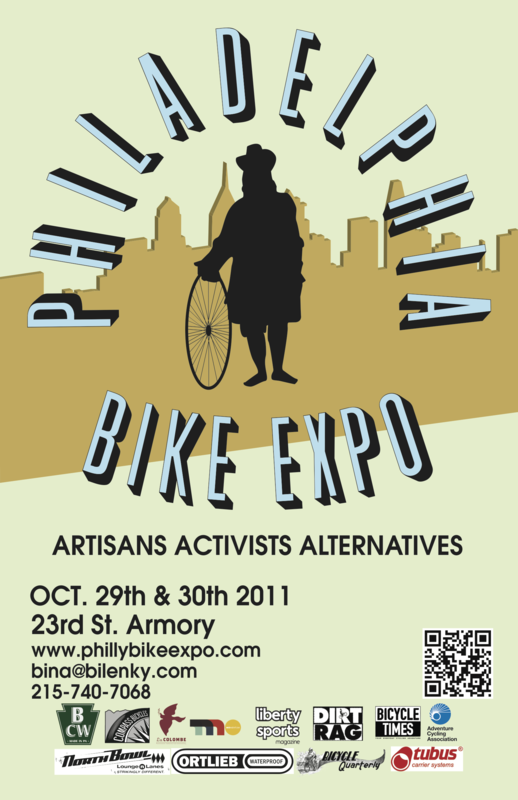 Philadelphia’s Bilenky Bikes is hosting the Philadelphia Bike Expo for another year in Center City Philly and this year it’s at the 23rd Street Armory, just around the corner from Rittenhouse Square and the Mutter Museum on October 29th and 30th, 2011. Bikes are back and it’s no new news. Bilenky has been championing beautiful bicycle frames in Philadelphia for many years which is why it’s appropriate that they would curate such an amalgamation of bicycle brands. Some particularly interesting companies in attendance will be Brooks England (classic leather saddles), Rene Herse (custom bicycles), and Rapha (cycling-wear company particularly cool for their collaboration with Paul Smith). We were able to catch Bina Bilenky for a few questions about the upcoming event. Here’s what we discussed. Click below to read the interview. AC: Tell me a little bit about the origin of the Philadelphia Bike Expo. BB: There hasn’t really been any bike shows in Philly since InterBike in the 90’s. We really wanted to create a bike show that was a celebration of cycling. The Philly Bike Expo started in 2010 and consisted of a show of framebuilders, larger bicycle manufacturers, components, accessories and apparel. We also welcome other organizations and companies that promote a healthy lifestyle and planet. Seminars, demos and parties rounded out the festivities. For the competitive individual we had a ‘fastest mechanic’ contest and gold sprints. We had over 2000 attendees and sold out all of our exhibit space the first year. With the exhibitor space almost half full already, we expect to sell out again. The Philly Bike Expo is held the last weekend in October at the 23rd St Armory in downtown Philadelphia. AC: What’s Bilenky’s involvement with the expo and will you be exhibiting any frames? BB: Bilenky Cycle Works is the organizer and producer of the expo. We will have a booth showcasing our bicycles. Last year our booth was a “Bilenky Parking” themed booth. Bilenky customers would leave the bikes on display while they walked around the expo. The pile of random Bilenky bikes was quite reminiscent of the BCW shop. We may step it up this year depending on how much time we have after organizing the show! AC: Are there any particularly exciting companies from last year you’d like to talk about? BB: Last year we had such a great mix that its hard to choose just a few to mention. Doug Fattic, a painter and framebuilder who runs a framebuilding school made the trip from Michigan along with two of his former students. Helm Cycles, also from Michigan and Gallus Cycles from Fort Worth, TX. Bishop Bikes from Baltimore, Cycle Monkey/Rohloff from Cali, Peter Weigle from CT, Velocolour from Canada, ANT from MA, alloneword (awesome handmade caps) came from Alameda, CA. BB: Cysco Cycles from Tennessee, Vaya Bags from Long Island, NY. Rapha (stay tuned for rides and possible party), Thomson out of Macon, GA, Brooks England, Cycle Design, Rene Herse. Surprise seminar presenters from the early days of mountain bike building. Bicycle Fashion Showcase put on by the fashion dept at Philadelphia University. You can get all the juicy details on the upcoming show at Bilenky’s website. We plan on being in attendance at this show so if you’re in the area, get in touch!